The Jefferson County Sheriff's Office also operates a MU-2 Turbo Prop fixed wing airplane for prisoner extraditions…what does that mean? Criminals are highly mobile and transient. They travel to and from communities and states on a regular basis as they apply their criminal trade. Fortunately, in America we have an excellent communication system that allows law enforcement agencies to communicate and cooperate in the apprehension of criminals. When criminals are caught they must be returned to the community in which they committed their crimes for trial and detention. It is extremely expensive to travel to other states and communities by motor vehicle or commercial airlines to bring back these suspects and or criminals. Airline schedules are not conducive to doing one day trips to many different communities which generally means that the officers have to spend the night before returning home which incurs a cost of hotel rooms, rented cars, meals, etc. 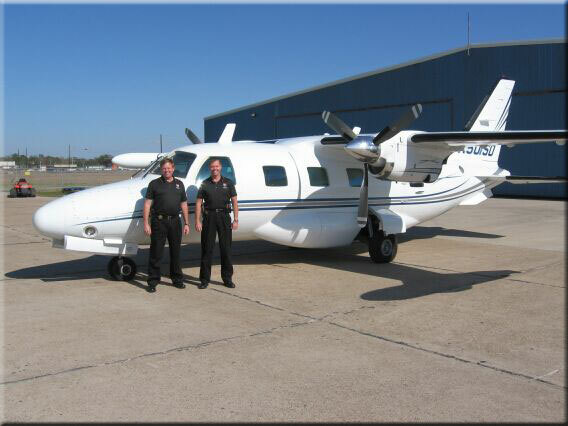 By using our own aircraft we reduce these cost, prevents the prisoner from being in the presence of the public, and enables us to pick up or drop off many other prisoners to and from destinations. We have two deputy pilots that perform these law enforcement duties as well as an aircraft mechanic that oversees the maintenance procedures and up keep of all the aircraft.